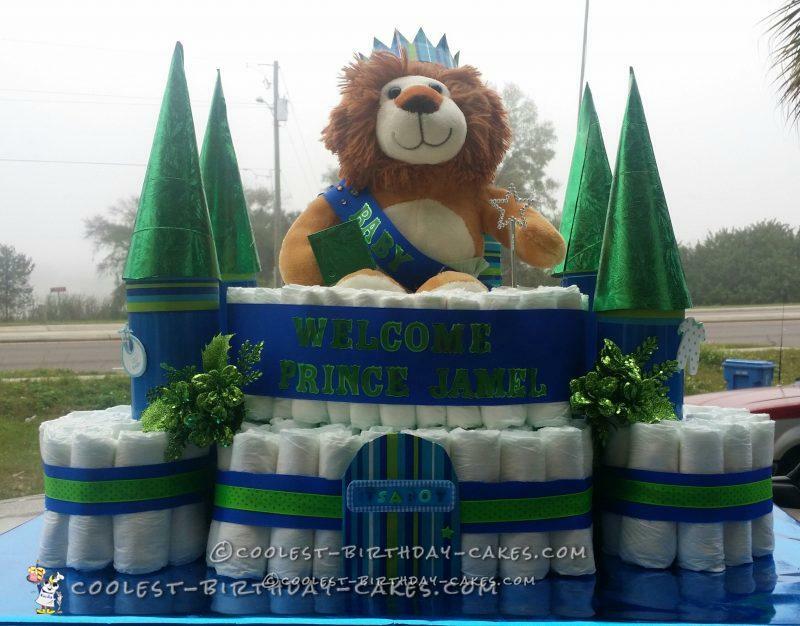 I made this Prince of the Castle diaper cake for a friend who was surprising her daughter with a baby shower. 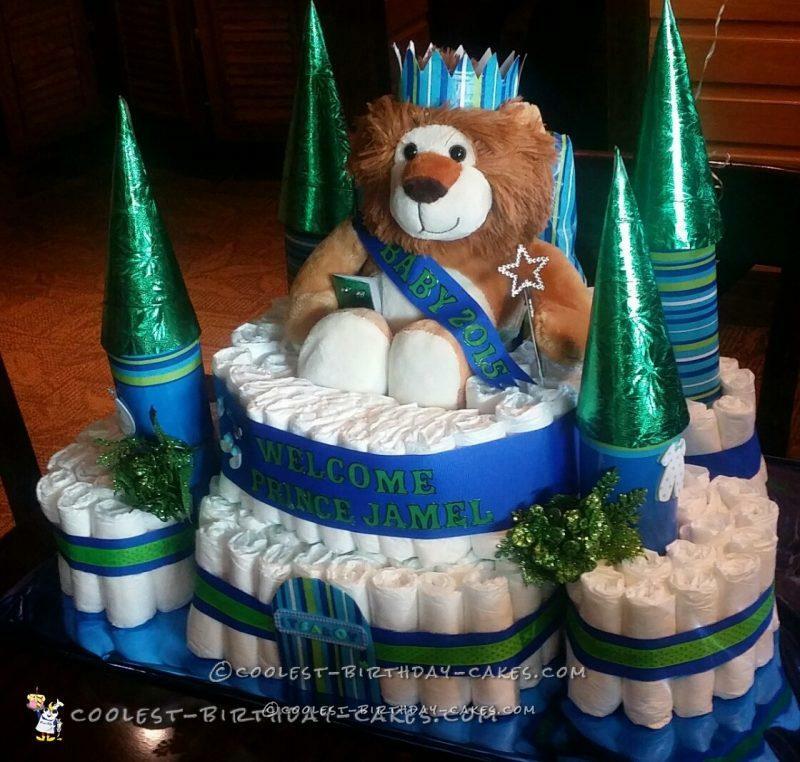 When my friend found out that making diaper cakes had become a hobby of mine, she asked me to make one for her daughter. I found out the colors and the theme of the shower and went to work. The theme was a royal one in which everyone would be dressing in royal attire (fake of course). I made the cake and the day came for the presentation. When I got to the event the parking lot was totally full because she hosted it at a restaurant outside of a shopping mall. I couldn’t find any space close to the restaurant. I literally had to park at the very back of the parking lot. As I began to walk I not only realized just how heavy the cake was, but also how high my stilettos. Walking with the cake in heels became increasingly uncomfortable. I thought I would never make it to the restaurant. When I finally got there I looked like a hot mess. My curls had dropped, I was sweaty, and feeling as though I were going to pass out. I greeted everyone and put the cake on the table. Then, I realized the lion’s crown had fallen off. I couldn’t imagine where it could have gone. I looked under the table. I ran to the door and looked outside. Finally, I decided to take a trip back to the car. Of course, by this time my once beautiful brand new black stilettos with the gold chain that goes across the ankle was digging into the back of my ankle. The more I walked the more pain I felt. I looked and looked and I couldn’t find that crown anywhere so I went back into the restaurant. Again I looked under the table and around the chairs. I ask some patrons, but no one seemed to know where the crown had gone. My only choice was to once again head back to the car. Once I got there, something told me to stand back and look at the car and when I did… there was the crown up under the car. I would have never found it. To make a long story short the daughter was late. She looked as though she was about to burst and she was not very surprised, but she really enjoyed the cake.